Born in Jersey, raised in sunny Arizona! 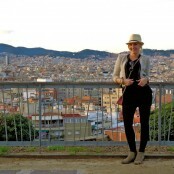 Laura has recently returned from a year and a half of working and traveling abroad. After receiving her Bachelor’s degree from Arizona State University, Laura moved to London where she completed her Master’s degree in Forensic Psychology and thoroughly enjoyed the change of weather that the UK had to offer. After completing her Master’s, she returned home to Arizona for a few months then continued her travels to Southeast Asia and Australia where she explored the different cultures and worked in Sydney. In her spare time she loves spending it outdoors, finding the best happy hours and going for swims. Fun Fact: she loves all animals, especially pigs and alpacas!